“Low-dose effects” refers to effects claimed by some scientists to occur at dose levels below those tested in standardized toxicology studies. Although no scientific consensus has been reached in defining “low doses,” the term is typically used to describe doses below the No Observable Adverse Effect Level (NOAEL) or below a level that is environmentally relevant to humans. NOAELs are determined by toxicity tests in rodents. Some scientists claim that environmental exposure to certain chemicals can mimic hormones capable of causing effects in laboratory studies at low doses and that these effects may not be detected because standard toxicology studies are typically performed at higher doses. This is the “low-dose” hypothesis (i.e., low doses produce effects not observed at high doses). There is currently no consensus regarding the existence and/or relevance of low-dose effects and they remain an issue of considerable scientific debate. 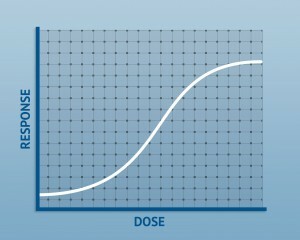 Studies of low-dose effects often suffer from various methodological deficiencies, such as the use of small numbers of animals, single doses, and weak statistical analyses and experimental designs. Reported low-dose findings are often of questionable toxicological relevance. For example, even in cases where biological responses are detected, not all observations at “low doses” are necessarily adverse or precursors to adverse effects in living organisms. Robust studies, including some performed by the United States Environmental Protection Agency (USEPA) using three-generation reproduction studies, have not been able to reproduce reported low-dose findings related to endocrine disruption. In other studies, findings were reproducible but not consistent among different laboratories. Without consistently reproducible findings, low-dose effects cannot be validated. Selective citation of studies without examining whether the examples were consistent and coherent with other relevant information, and selective dismissal of studies that did not show low-dose effects. Failure to evaluate all studies equally and apply uniformity in the evaluation of specific studies (i.e., those with positive results were evaluated differently than those with null results). Lack of documentation as to whether exposures in the studies evaluated were truly ‘‘low-dose’’ and relevant to humans. The inclusion of studies that did not address adverse effects, rather transient, adaptive responses. As a result of these issues, the USEPA has commissioned the National Academy of Sciences to investigate low-dose effects and endocrine-disrupting chemicals by applying a systematic review process to critically evaluate all available data. This report will be considered by regulatory authorities prior to considering any changes, if any, to the currently well-established, regulatory testing system for crop protection products and other chemicals. A considerable body of scientific evidence does not support the low-dose hypothesis and there is no scientific consensus regarding the existence and/or relevance of low-dose effects. Moreover, the current testing approaches identify and establish appropriate NOAELs in the low-dose range of exposure, therefore, changes to these approaches are currently not justified in relation to low-dose effects. Tyl RW, Myers CB, Marr MC, Thomas BF, Keimowitz AR, Brine DR, Veselica MM,Fail PA, Chang TY, Seely JC et al. 2002. Three-generation reproductive toxicity study of dietary bisphenol A in CD Sprague-Dawley rats. Toxicol Sci. 68:121-146. Rhomberg, LR; Goodman, JE. 2012. “Low-dose effects and nonmonotonic dose-responses of endocrine disrupting chemicals: Has the case been made?” Regul Toxicol Pharm. 64(1):130-133.